I am determined not to miss this months link up, although with internet issues today anything was possible. 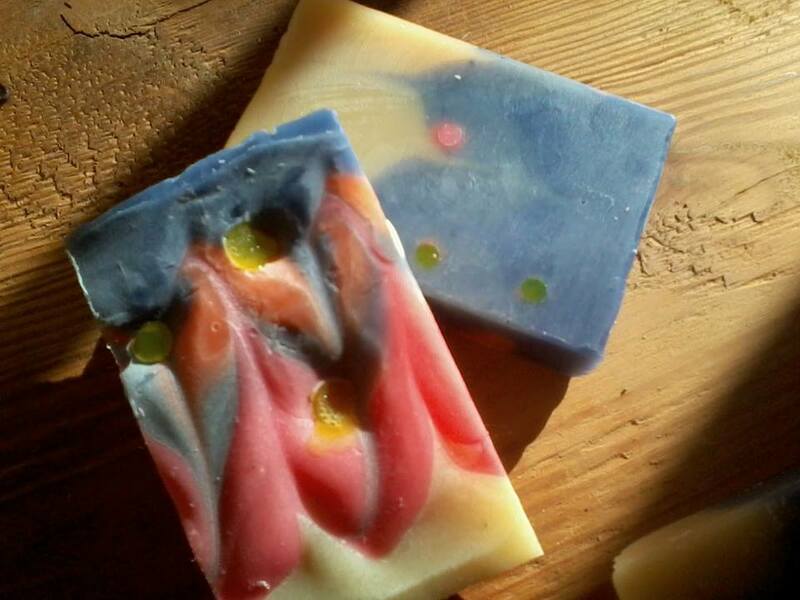 The challenge Amy from Great Cakes Soap Works set this month was called the mantra swirl. I have seen this done on soap queen, but had never thought to attempt it. Well after paying my fee, I was stuck. I did a trial run the photo is on my facebook page. 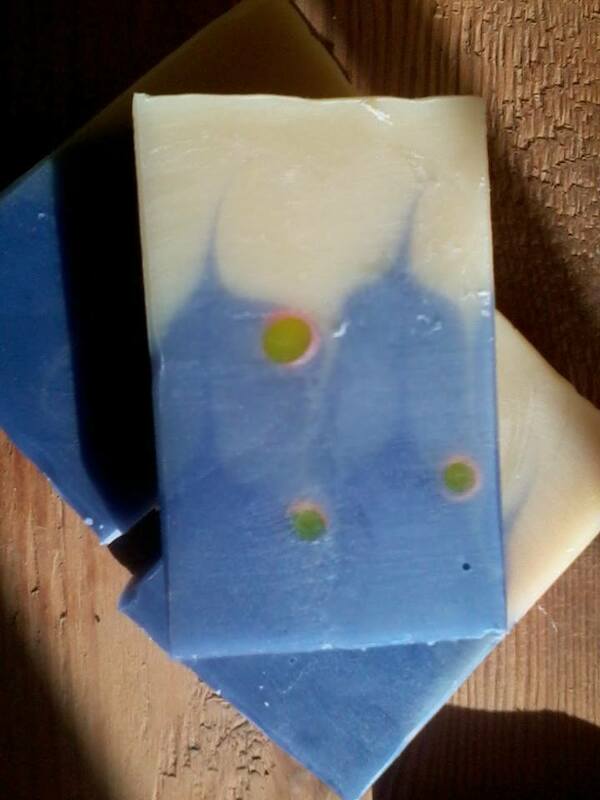 I scented it with Brambleberry's Apple Jack Peel, the first time I had used that fragrance, it wont be the last, it is so yummy, just like apple pie. I was happy with the end result but knew I could do better. So I spent time thinking and planning, and setting up. I was inspired by the fact that we are almost at mid winter, and while it has been quite mild, the last few days have turned cold, and it has been snowing on the mountains. So my natural thought for scent was Brambleberry's Fresh Snow, I had a "snow scape" in mind, so I kept one layer white, and had the next two layers in different shades of blue. Then I squirted brite orange and fried up fuchsia in between each of the layers to give a sunset look. After I swirled it put drinking straws randomly in the blue/orange/pink. After it had set I pulled the straws out and filled the holes with yellow M&P, to give the appearance of stars. Now I know that stars don't come out at sunset, but that is my artistic licence, and it is just something I wanted to try. The pink and orange didn't make it very far down the soap. And I could have made the yellow a bit brighter, but it is my very first time using M&P soap, so that is my excuse on that front. I am happy with the end result, and will be doing the mantra swirl again. Cant wait to see all the other entries. I have seen a couple on FB and they are stunning. Love your straw idea. Have never seen that before, very cool! Thank you for your comments. I would love to take credit for the straws but saw it on Ruth Esteves' blog first and was inspired. Very nice! Love your colors! I had not seen the straw idea before. That is pretty cool! I love the snowscape theme. 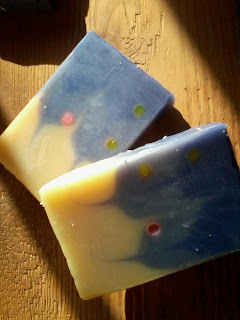 Your soap looks really neat! Now that's unique.... Love that you changed it up a bit wih the addition of the Dots :) too cute! This is so creative and beautiful! I love how you made the "stars"! 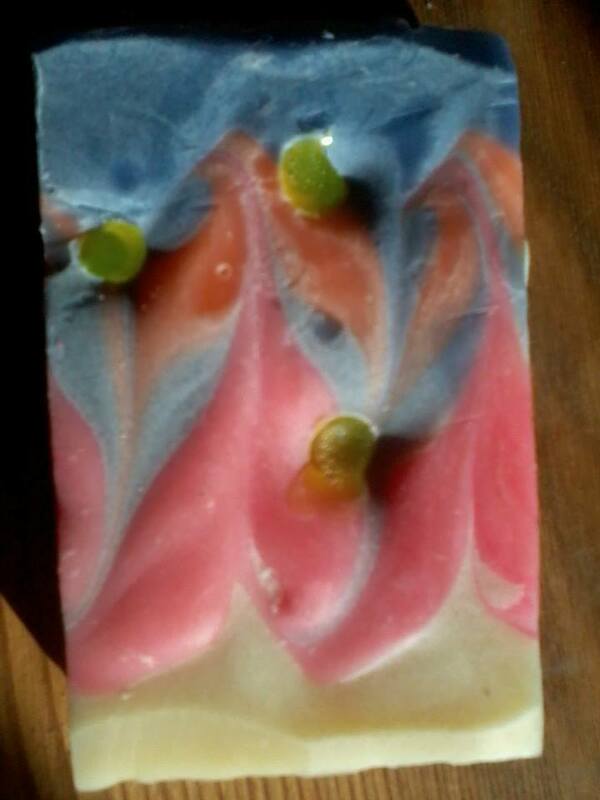 Beautiful mantra swirl! Love the embeds. How fun! I love your interpretation of the mantra swirl! mantra + embed, a great idea. You deal well with it. Thank you all so much for the lovely comments. I really appreciate them.